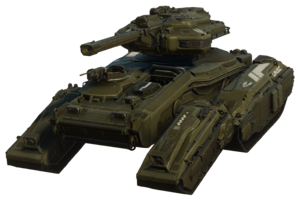 This article is about the iteration of the Scorpion tank introduced in Halo 5: Guardians. For other uses, see Scorpion (disambiguation). The M820 Main Battle Tank (M820 MBT), commonly known as the Scorpion, is the United Nations Space Command's primary main battle tank, introduced in 2557. Manufactured by Chalybs Defense Solutions, the M820 Scorpion is the successor of the M808 model used throughout the Human-Covenant War. The M820 Main Battle Tank is similar in most respects to its predecessor, the M808 Scorpion—it is a lightly built, highly mobile weapons platform, utilizing four independently operating tracked bogies for high maneuverability on rugged terrain, and features a low hull profile with a highly placed cannon, with a cuppola pintle-mounted crew-serviced machine gun and room on the bogies for limited troop transport. It differs from the M808 in a number of important ways, however, it is significantly lighter than its 66 ton predecessor—at only 35 tons—and can achieve a top speed of 128.7 kilometers per hour (80 miles per hour), a significant improvement over the M808's top speed of 96.5 kmph (60 mph). However, it does not exchange mass for armor protection, retaining its survivability. More importantly, the new Scorpion is built from the ground up with new technologies and techniques, lacking the Scorpion's deferred technology revisions and historical compromises. The Scorpion is outfitted with a 150mm M990 electrothermal-chemical smoothbore cannon, breaking legacy ammo compatibility with its M808 predecessor. Instead, the M820 Scorpion's cannon accommodates both planned cannon-launched guided munitions and future advances in energetic propellants. The Office of Naval Intelligence variant uses an experimental ammunition, and a variant of the Scorpion currently in skunkworks development by Hannibal Weapon Systems is set to incorporate directed-energy weapons, a laser-firing primary cannon and a Gauss repeater turret. The mainline M820 Scorpion is also armed with a pintle-mounted machine gun. Corp Scorpion: An up-armored variant used by Liang Dortmund security forces to defend remote installations. Tundra Scorpion: A Scorpion variant featuring tundra camouflage and better armor than the Corp variant. Urban Scorpion: A Scorpion variant featuring urban camouflage and better armor than the Corp variant. Used by UNSC Army and UNSC Marine Corps units for deployment against Insurrectionists in urban areas. Woodland Scorpion: A Scorpion variant featuring improved off-road maneuverability, simplifies air transport into remote areas and has better armor than the Corp variant. ONI Scorpion: The ONI "security" Scorpion features heavier armor than the Urban variant and has an upgraded cannon utilizing experimental ammunition. XM820B4 Scorpion: Also known as the Hannibal Scorpion, the XM820B4 is a variant upgraded by Hannibal Weapon Systems, serving as one of the corporation's several test bed tanks, outfitted with heavy armor and a directed-energy weapon. Following the loss of Chalybs Defense Solutions' facilities on Meridian in 2551, Acheron Security assumed production of the M808 Scorpion. Chalybs introduced the M820 MBT as the successor to the M808 in 2557. Though the M808 continued to serve in UNSC Army and Marine Corps armored units after 2557, the M820 Scorpion began to replace older models after its introduction. By October 2558, the M820 had replaced its predecessor in War Games simulations aboard UNSC Infinity among its Spartan forces. Chalybs offers a number of variants - UNSC armored units operated the baseline Scorpion, as well as Tundra, Urban, and Woodland variants with camouflage paint schemes and improved armor, while ONI operates its own Scorpion variant for its Security forces which featured superior armor and used experimental rounds to improve lethality. Chalybs also offers a civilian variant of the Scorpion for private military contractors, the Corp Scorpion, which features superior armor to the baseline model. The UNSC contracted Hannibal Weapon Systems to provide an up-armored variant of the Scorpion featuring a directed energy weapon based on the M6 Spartan Laser in place of the M990 turret, and replacing the pintle-mounted machine gun with a Gauss cannon similar to that mounted to Hannibal's up-armored Mantis. At least one Corp Scorpion was owned by the Liang-Dortmund Corporation and was present on Meridian when it came under attack by Promethean forces in October 2558. Governor Sloan authorized Fireteam Osiris to use the Scorpion to assist his own security forces with the defense of the colony, releasing it from its corporate operator, William Khaleed. One M820 Scorpion was accidentally caught in the slipspace wake of Guardian 3209 on its way to Genesis, and was encountered by 031 Exuberant Witness during the Battle of Genesis. She offered it to Fireteam Osiris during their mission to meet up with John-117 and the rest of Blue Team at the Gateway. Alternate render of the Scorpion in Halo 5: Guardians. Fireteam Osiris using an M820. Fireteam Osiris using a Corp Scorpion during the Battle of Meridian. An M820 during a Warzone simulation on March on Stormbreak. A Scorpion on March on Stormbreak. Concept art of the M820's machine gun. The side of a damaged Corp Scorpion. HUD of the Scorpion by Edward Buck in the Halo 5: Guardians campaign. HUD of the Scorpion in Halo 5: Guardians. HUD of the gunner for the M820. A Scorpion and Corp Scorpion on Escape from ARC. A Woodland Scorpion and a Tundra Mantis. A Tundra Scorpion leading two Scorpions. HUD of the ONI Scorpion. A Hannibal Scorpion charging its cannon. HUD of the Hannibal Scorpion. A Scorpion, Corp Scorpion, and Hannibal Scorpion. The symbol seen in the back of the Scorpion. ↑ The model of the Scorpion in Halo 5: Guardians has a coaxial machine gun visible, but it is not usable.